How to Get Free iPhone Ringtones without iTunes? Customize your favorite songs and music files to iPhone ringtones, and enjoy hearing such songs once you have an incoming call. Set custom ringtones for individual contacts on your iPhone to easily identify your caller from the ringtone. Eliminate boredom that’s caused by boring iPhone default monotonous ringtones. There are so many ringtone maker tools for iPhone that can give you a whole lot of options and features in making custom ringtones than iTunes. We shall be enlisting and discussing them in the following paragraphs. We shall also be discussing how to get free ringtones with best ringtone maker called iMyFone TunesMate Ringtone Maker. Part 2: How to Get Free Ringtones on iPhone without iTunes? 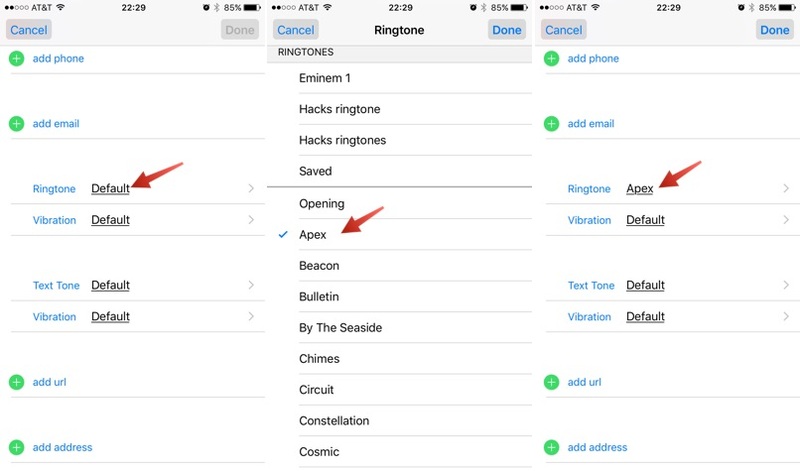 Part 3: How to Set a Default Ringtone and Assign Individual Ringtones on iPhone? 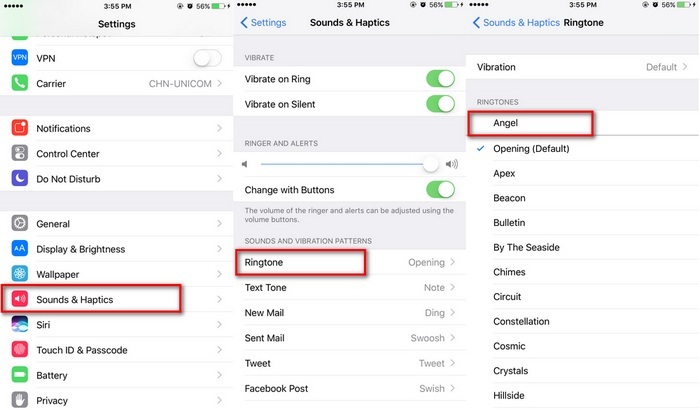 With the following 5 apps, you won’t be limited to default ringtones in your iPhone ringtone library. They can help you to make a special piece of music or cut and convert some part of your special music into iPhone ringtone. If you’re looking for tons of licensed iPhone ringtones for free, then you should try Ringtone Free as your iPhone ringtone maker app. This app can turn any song or track to iPhone ringtone without any hitch. It also offers you a feature that can help you edit your custom ringtone and record sounds, processes the sounds and edits them at your convenience. This app exists only for iPhone and iPad, and cannot be used on an iPod or Android devices. If you’re looking for a library with unlimited free tones, then downloading and installing Ringtone for iPhone & Ringtone maker on your iPhone won’t be a bad idea. 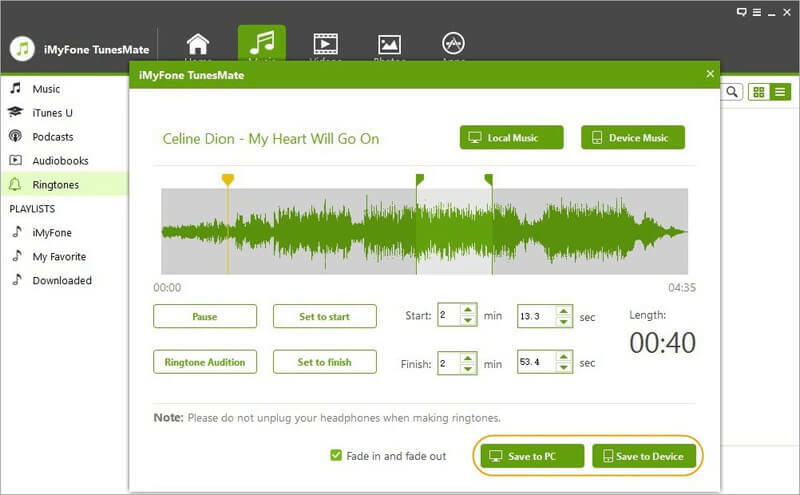 This app offers you pitch and volume adjustments, fade-in and fade-out options, and privilege to record family and friends’ voice as ringtones. You can share your ringtone creations on social media like Facebook and Twitter. To get custom ringtones on iPhone is easy with Ringtones 500000+. You can download as many custom ringtones as you want. This app maintains a good catalog of ringtones under such categories as comedy, hip-hop, country, pop, etc. This app makes it pretty easy for you to create ringtones from your existing iPhone songs, you can also record an external audio and convert it to iPhone ringtone with this app. Ringtone Converter is another magnificent ringtone maker for iPhone. It allows you to create ringtones from existing tracks on your iPhone, but it only allows you to create 30 seconds tones. If you need a tone longer than 30 seconds, then you have to use some other apps, and it doesn’t offer in-app purchases. Just like every other ringtone maker, Ringtone Designer helps you create ringtones from existing songs on your iPhone. It can help you assign different ringtones to different contacts on your contact list, but the length of your ringtone is limited to 30 seconds. 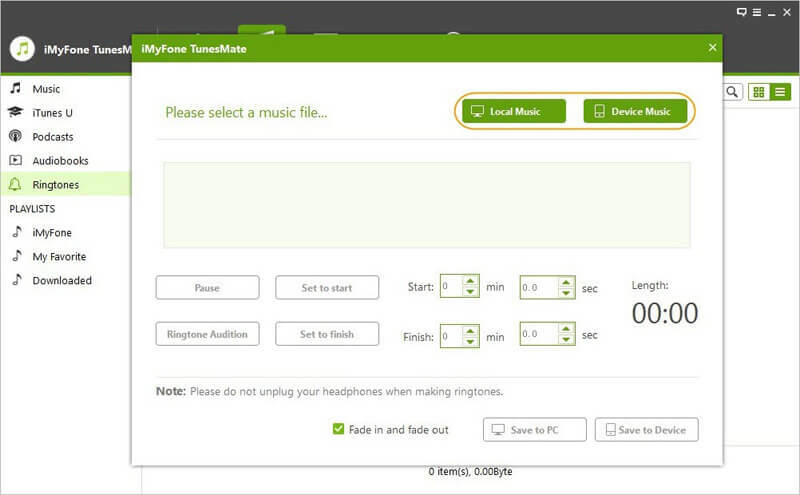 iMyFone TunesMate is an iTunes alternative that helps you to make and manage ringtones on your iPhone. Making or uploading custom ringtones with TunesMate is hassle-free, and you won’t be bordered with iTunes restrictions or limitations because TunesMate can work well without opening iTunes. 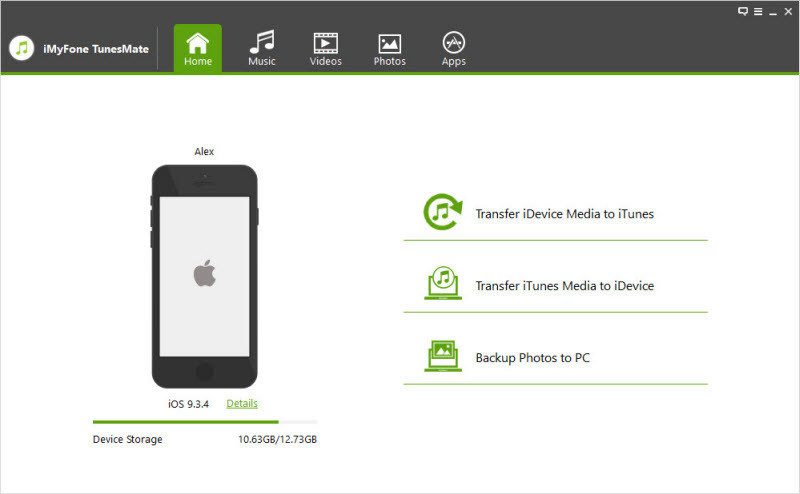 This app can also help you to manage other media files like music, videos, playlists, photos, etc. So, it has more features than every other ringtone maker app we’ve listed above. Make iPhone ringtone from any song in few clicks. You can get your ringtones on iPhone from your PC using TunesMate. 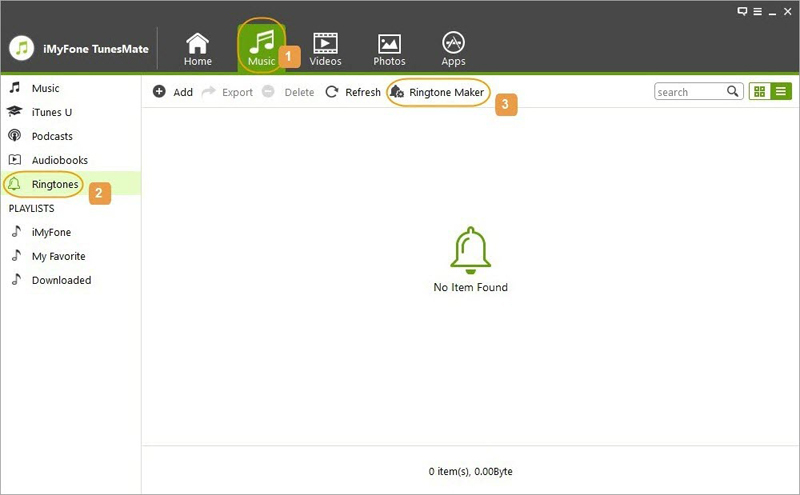 Create free and compatible ringtones for iPhone, and assign ringtones to contacts using TunesMate. Enjoy two-way ringtone transfer features; transfer tones from iPhone to a laptop or from laptop/iTunes to iPhone. Sync other media files to iPhone without losing your important data and files. Step 1Launch iMyFone TunesMate and connect your iPhone to your computer. Step 2Click "Music" icon at the top bar of iMyFone TunesMate home interface, and then choose "Ringtones" from the left side bar. Step 3Select "Ringtone Maker" and then click "Local Music" or "Device Music" to select the song you want to make ringtone from computer or your iPhone. Step 4Pick up a section by setting ringtone start time and stop time with "Set to start" and "Set to finish" buttons. After that, you can click "Ringtone Audition" to preview the result. Step 5Click "Save to Device" to save created ringtone onto your iPhone. Also, you can save ringtone onto your computer by clicking "Save to PC". Step 1.Tap Settings app from your iPhone home screen. Step 2.Click "Sounds & Haptics". Scroll down to "Sound and Vibration Patterns" to select "Ringtone". Step 3.On the ringtone menu, you'll see a list of ringtones on your iPhone and the one that's currently in use. Click on the ringtones to preview them, then select the one you want and the checkmark sign will appear close to it. You’ve selected a ringtone. Step 1.Tap "Phone" app, then click the Contact menu at the bottom center of the screen. Step 2.Scroll through your contact lists to find the name you want to assign a ringtone to, then tap on the name. Step 3.Click Edit > Ringtone. The list of ringtone in your iPhone will be displayed. Click on the ringtone to select and preview it. Step 4.Click Done to save your selection. What If iTunes Won’t Play Music? The Best Answer Here! iTunes Not Syncing Music iOS 12? 5 Solutions to Fix It!